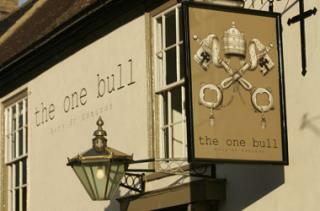 The One Bull pub on Angel Hill in Bury St Edmunds is all set to re-open its doors again from 5pm on Thursday 1st February. The pub had to close at the end of September as a result of devastating damage caused to both the pub and upstairs flat by the fire at Cycle King next door. Originally, owners David & Roxane Marjoram thought that the pub would be closed for just a few weeks but it soon became apparent that the water damage was more serious than first thought. After what felt like a long 4 months, the pub is ready to welcome back its customers with freshly painted walls, new flooring plus a few tweaks here and there and The One Bull team can't wait. The ethos of the pub - to offer fresh, seasonal, regional food, an award-winning wine list, their own Brewshed ale and great coffee in comfortable surroundings - remains the same. New menus have been tested, wine and beer deliveries are en route and the much-loved coffee machine is up and running. David Marjoram said 'It's been a tough time but we are almost there now and we wouldn't have got there without the help and support of a lot of people - all of whom we'd like to thank'. The Marjorams live above the pub with their two children, Daisy (aged 11) and Lola (aged 7), and had to move into temporary accommodation for 3 months before moving back into the flat just before Christmas. Roxane Marjoram said 'It was a huge relief to be back, we didn't care that the flat wasn't totally finished, we just wanted to be home for Christmas'.